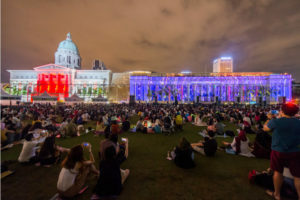 Image: Light to Night Festival, 2017. Image Courtesy of National Gallery Singapore. Sign up for email communication from Machineast. *All our communications contain an unsubscribe link and we will never share your data with third parties. All work on this site copyright © 2019 Machineast Pte. Ltd. or their respective copyright holders. Please do not use without permission.